I urge you to go and check out his whole post. Books on depression are a dime a dozen. Books on depression by Lutherans are rare, so rare in fact that this may be the only one I’ve read. So what does it have to offer us? It has excellent, simple and understandable definitions of the various aspects of depression. It does a good job balancing the situational, biological and spiritual dimensions of the illness. In that respect I would say that the chapters on a clinical look at depression (Chapter 2) and how depression is treated (Chapter 3) are probably the best. These are two areas where most Christians will have little or no understanding. The book is short. This is very good. Some of the books about depression on my shelf (e.g. The Noonday Demon) are hundreds and hundreds of pages. While the material may be worthwhile, it becomes completely unaccessible because of the morass of words. One of the authors (Rev. 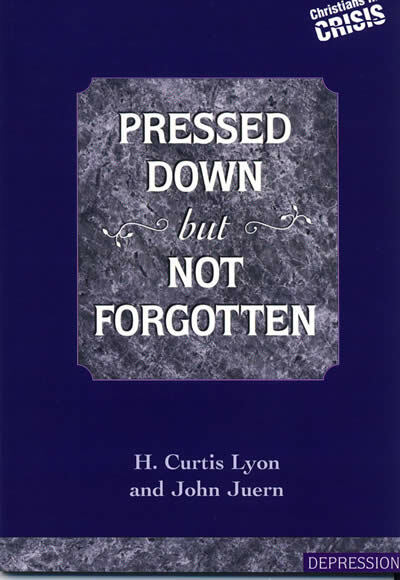 Curt Lyon) is a WELS pastor, and the other (Dr. John Juern) is a WELS layman and clinical psychologist. What this means in this case is that there is a pretty good basic understanding of the Gospel at work, there’s no decision theology or any blatant heresies. There are other problems,, though, which we will get to in a moment. I also like the use of case studies to understand a given situation or problem associated with depression. While it gets a little old by the end of the book, it is for the most part effective and helpful. A couple issues with the book stick out. First of all is the ugly and really cheesy graphics. Smiley faces and frowney faces. Blech. Patronizing and silly. Spare me. The book originally came out in 1996, so almost everything in there about medication is dated. The general concepts are correct, but most people won’t even recognize the names of the medications cited. It needs to be updated. The real problem with the book, though, is theological. It’s not any kind of heresy or false doctrine. The problem is that the author’s never make the connection between the cross and here-and-now. It is completely asacramental or even anti-sacramental. I have found this tragically common in Wisconsin Synod publications, and this is no exception. While the beauty and comfort of Jesus’ death is held up, how that comes to us now (the Word and holy Sacraments) is never even mentioned in the book. Holy Absolution has no mention, either. Now this doesn’t surprise me. Most people don’t get that. But it is such a critical thing, especially for someone who is clinically depressed. The sacraments are extra nos, they come from outside of us. My baptismal identity frees me from the shackles of my own pathetic works. I am free, because I am in Christ. This is one of the most comforting things that the depressed can hear, and it is completely absent in the book. So overall I’d give it about three stars out of five. It has a place on my shelf and is good, but the Lutheran work on this important topic has yet to be written.